The High Court of Kerala today directed the state government and Travancore Devaswom Board to file statements apprising the Court of measures taken by them to ensure smooth and safe pilgrimage of women in the age group of 10 to 50 years to Sabarimala temple. 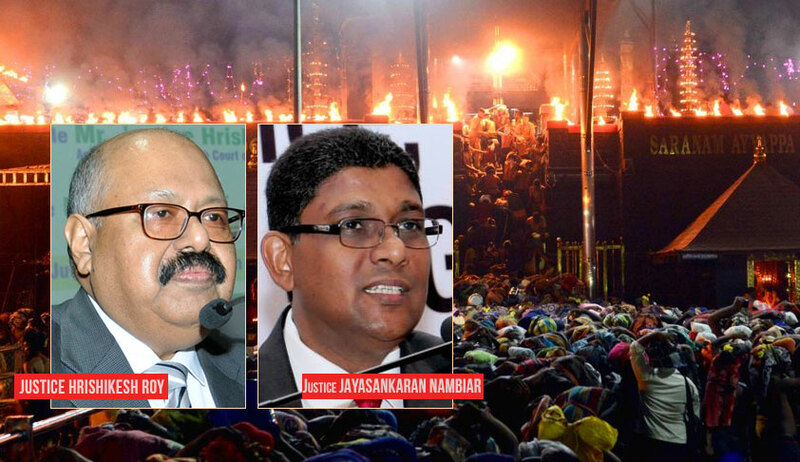 The Division Bench of Chief Justice Hrishikesh Roy and Justice Jayasankaran Nambiar was acting on a PIL filed by four women seeking directions for making sufficient arrangements and security measures for women of all age groups to visit Sabarimala as per the right declared by the Supreme Court in Indian Young Lawyers' Association case. The petitioners submitted that they were ardent devotees of Lord Ayyappa, who were desirous of visiting the temple during the mandalakalam season. They had made online booking for "darshan" on November 19. However, they decided not to undertake the pilgrimage in view of the threats issued by groups opposing women entry. According to the petitioners, persons resorting to violent and intimidating protests to oppose women entry are functioning under the aegis of BJP, Congress, Hindu Aikya Vedhi, Sabarimala Karma Samiti etc. The leaders of these groups are making inflammatory statements to terrorize women. Those women attempted to visit the hill top shrine during "thula masa pooja" had to back off in the face of violent agitations. The counsel for the petitioners submitted that they had convened a press meet last Monday to announce their decision to put off pilgrimage till normalcy was restored in the region. Knowing about the presence of petitioners in the Press Club, protesters gathered in no time, besieging the building. The petitioners could be taken out of the building only with police aid, the counsel submitted. The petitioners faced verbal abuse in social media as well. In this backdrop, the petitioners made a suggestion before the government to set apart two or three days during mandalakalam season for exclusive visit of women. All the agitators should be removed from temple premises for safe visit of women, the petitioners suggested. During the course of hearing, the Bench observed that unless steps are taken by the Board and Government to effectuate the declaration given by the Supreme Court, safety of women pilgrims cannot be ensured. The Standing Counsel for the Board submitted that it has filed a petition in the SC seeking time to implement the judgment. The State Attorney submitted that the suggestion of setting apart few days exclusively for women could be explored. The Bench orally remarked that the "atmosphere is surcharged" and women's visit at this juncture might be akin to "walking into trouble". Observing that the "situation has to be handled with care", the Court expressed its concern for the safety of women pilgrims. The Board and the Government have to file statements within seven days.